On Thursday, First Data announced the launch of its IPO of 160mm shares of Class A common stock, with the underwriters having an option to purchase an additional 24mm shares, at an offering price expected to be $18-20 per share and with proceeds used to redeem ~$2.5bn of debt with an average coupon of 12.3%. After the IPO, First Data will have total debt of $18bn on expected 2015 EBITDA of $2.8bn. We value the company at 14x EBITDA for an enterprise value of $39bn and equity value of $21bn or $21/share. We have a neutral rating on First Data, and prefer VNTV. Square is not the biggest risk to First Data and will not disrupt the payments industry. It is disintermediating cash, not card, transactions and is more likely to be adversely affected as acquiring-processors march down-market to micro-merchants (through products such as First Data’s Clover Station) than it is to be able to march up-market and disruptively attack the value-chain of incumbent acquiring-processors in the small-to-mid-size (SMB) segment. A key reason is that Square vertically-integrates its hardware/software solution at point-of-sale with transaction-processing while most small-to-mid-size (SMB) retailers will prefer “gateways” that enable software solutions at point-of-sale, including improved data-security (e.g. through point-to-point data encryption) and analytics (e.g. bookkeeping, inventory control and fraud risk/customer-relationship management) while providing connections to multiple acquiring processors. The biggest risk to First Data is the commoditization of acquirer-processing as clients become more sophisticated about pricing (so that, across the industry, new merchants are signed at rates of only about 60% of those for existing clients) and as eCommerce gateways extend their franchises to physical point-of-sale catalyzed by the deployment of software solutions for offline as well as online transactions (so that one-third of processing revenue from merchants will be acquired by software solutions by 2018 versus one-quarter in 2013 – see Chart 1). These gateways increase price-pressure by relegating merchant acquirers to commoditized back-end processing. Monetizing the Back-Book: CEO Frank Bisignano is explicit about this opportunity “we have moved beyond payment processing [and] believe that our long-term success will be driven by focusing on helping our clients grow their businesses by providing them with a suite of commerce-enabling technologies as well as our broad set of existing [e.g. data-security and business management] solutions”. The sheer size of First Data’s client base allows it to develop and deploy these commerce-enabling technologies, including Clover, at advantaged scale. Expanding Distribution: At the same time as monetizing the back-book, First Data is positioning to increase new clients through a 20% expansion in distribution capacity in 2014 and, like GPN, through continuing to extend its expertise in bank/non-bank acquiring alliances overseas; for example, in 2014, First Data launched an acquiring business in Brazil through an alliance with the banking cooperative Bancoob. The firm already has alliances with leading US and global banks, including BAC, WFC, C, PNC, and STI, Lloyds, and ABN Amro (although the firm lost out to VNTV in some recent bank signings in the US including COF and CMA). We expect the combination of selling value-added services to the back-book and more aggressive new signings, both in the US and overseas, to allow First Data to grow revenues at 3-5% in constant-currency (albeit towards the lower end of the range in 2016 given low-single digits growth in the issuing business accounting for 21% of firm-wide revenue versus the acquiring business accounting for ~60%). This will translate to high single-digit growth in EBITDA given significant expense leverage (with operating expenses representing over 90% of revenue) and the rationalization opportunity to hold expense growth at 1-2% (after a long period from 2007-2013 during which the firm was under-managed). We value First Data at 14x expected 2015 EBITDA of $2.8bn for an enterprise value of $39bn, translating to an equity value of $21bn or $21/share. In merchant-processing, value is shifting to gateways which stand between software-enabled retailer point-of-sale (iPOS) systems and acquiring-processors, provide data-security and analytics, and have the effect of relegating acquiring-processors to a back-end processing function. One way to think about gateways is as “virtual” payment terminals and they are a requirement whenever a payment is accepted using software rather than specialized hardware. Hence, for example, they are a requirement for online transactions (giving rise to eCommerce-gateways), for mobile transactions (giving rise to app-gateways) and, increasingly, at physical point-of-sale (giving rise to iPOS-gateways) as retailers upgrade from “dumb” payment terminals that act, like rotary phones, to accept an analogue input (from the swipe of a magnetic card-stripe) and forward it to an exchange (in this case an acquiring processor) to “smart” terminals capable that, like smartphones, run software and are capable of integrating payments with business-management tools including bookkeeping, inventory control, and customer relationship management. McKinsey estimates that one-quarter of merchant processing revenue at physical point-of-sale is now through iPOS gateways and will rise to one-third by 2018. The threat of gateways to acquiring processors is that they are relegated to a back-end commodity processing role. They have responded by forward-integrating into the gateway business with VNTV’s 2013 purchase of Mercury being the most striking example, but face competition from other gateway-entrants including networks (with Visa’s 2010 acquisition of the Cybersource eCommerce gateway branded as Authenticate.net), terminal-manufacturers (as Verifone’s VHQ solution is effectively a gateway for physical point-of-sale), and payment service-providers (with PayPal’s 2013 acquisition of Braintree extending its gateway capabilities from browser to app and hence, as mobile payments gain traction, to physical point-of-sale). First Data has an eCommerce gateway, and processes over one-quarter of global eCommerce transactions, and its bundled hardware/software solution for the SMB segment, Clover Station (which competes with Square) is a gateway in that it is not bundled with First Data processing. However, given capital-constraints and unlike other firms, First Data has not expanded its gateway capabilities aggressively through acquisition and is now not as well-positioned as PayPal and Visa/Verifone to build app-gateway capabilities. This is true of VNTV as well but we nonetheless prefer VNTV over First Data (see Exhibit 1) because of its cost-leadership, which arises from processing all transactions through a single, consolidated platform, and because of its broader distribution capabilities particularly in the fast-growing (20% year-on-year) independent software vendor or ISV channel but also in the bank-channel where VNTV is winning mandates, such as from Capital One and Comerica, even though First Data continues to serve the largest banks including BAC, WFC, PNC, and STI. Square is not the biggest risk to First Data and will not disrupt the payments industry. From a business-strategy, as opposed to colloquial, standpoint disruption arises when an industry-participant develops a set of competitive capabilities through serving one segment of a market which can be deployed to invade the value-chain of incumbents in others. The canonical example is the innovations introduced in vehicle manufacturing by Toyota after the post-WW2 decline in military demand to serve the Japanese passenger market with low-volume runs of reliable cars in a variety of models. The 1980s deployment in the US mass-market of the resulting “just-in-time” capabilities (of managing reduced inventory, a vertically de-integrated supply-chain, and collaborative labor) proved competitively decisive. Some technology companies are disruptive in this sense. Uber, for example, developed capabilities in on-demand car-hire by providing an alternative to registered taxis in San Francisco (where licensing restrictions meant these taxis were expensive and unreliable), has used these capabilities to expand to geographies, such as New York and London, where the licensed-taxi services function better than in San Francisco, and will continue this geographic expansion as well as extending its franchise to markets, such as food-delivery, involving on-demand transportation. Disruption can support fancy valuation because the “blue-sky” promise of franchise-extension tends to delink investor-assessment of long-run potential from near-run earnings. The extreme unmooring of investment thesis from financial reports gives rise to unicorn valuations (which, ironically, is VC-lexicon for the celestial teapot introduced by Bertrand Russell to ridicule, rather than normalize, non-falsifiable beliefs and social-proofing). Square is not disruptive. The capabilities it has developed to enable micro-merchants to accept card payments (a dongle for mobile point-of-sale and tablet docking-station, marketed as Square Stand, as an alternative to a cash-register for fixed point-of-sale) will not be attractive to the small-to-mid-sized (SMB) or large-retailer segments. 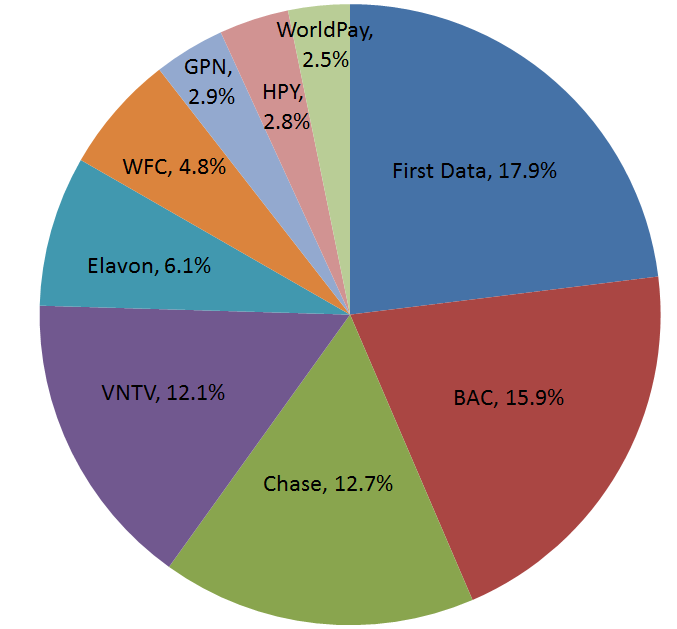 These segments do not share the singular focus of micro-merchants on reducing the set-up costs for card-acceptance but also care about integrating payments with business-management applications and, particularly in the case of larger retailers, lowering per-transaction costs, assuring data-security, and managing terminal-performance. Furthermore, the micro-merchant segment itself is not profitable even at-scale, because of high-turnover and fraud, which is why it has not been served by incumbent acquiring processors. Square is seeking to move up-market to the SMB segment and has launched a string of business-management applications around inventory-control, book-keeping, and customer-relationship management. This software is made available through the Square Register app which is vertically-integrated with transaction-processing and provides access only to the business-management tools built by Square. First Data has a competing solution, marketed as Clover Station, which provides access via the Clover App store to business tools from third-party developers as well as those from First Data and does not tie the retailer-client to a specific acquiring processor. We expect First Data’s open solution to be more attractive to SMB retailers than Square because of the broader variety of business management tools that arises from an app ecosystem and because of the ability of retailers to switch acquiring processors and hence impose price discipline. Large retailers will embrace neither Square Stand nor Clover Station because both run on consumer-based platforms, largely iOS and Android, and do not incorporate the data-assurance and terminal-management capabilities of more industrial-strength platforms such as VHQ from Verifone (as discussed in our report of September 27th titled “Square is Not PayPal”). Rather than Square, the biggest risk to First Data is the commoditization of acquirer-processing. Pricing, as measured by the net spread (calculated as gross revenue less interchange and payment network fees divided by sales volume) is falling sharply so that new “front book” merchants are being signed at rates only about 60% of those being on the “back book” of existing clients. In the face of a commodity-product (i.e. first capturing/authorizing a transaction and then clearing/settling typically over the Visa/MasterCard networks) acquiring-processors have protected against commodity-pricing through opaque presentation aided by the enormous complexity of the network interchange tables. 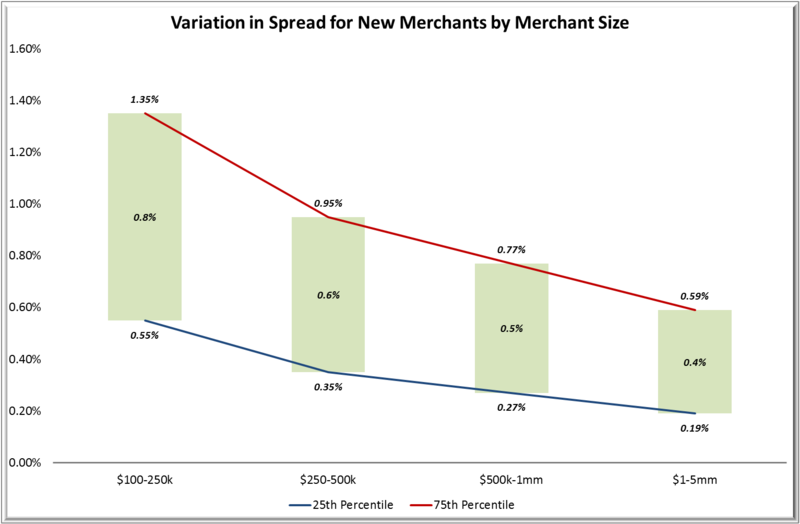 This has allowed the market to remain inefficient particularly for smaller, less sophisticated merchants as indicated by the wide variation in spread for new merchants (see Exhibit 2). However, the market is becoming more efficient as some players, such as HPY, compete on the basis of educating merchants about industry pricing tactics and we expect this variation to narrow driving further industry de-pricing particularly in the SMB segment. Acquiring-processors are responding to industry price-pressures through re-pricing the base processing service on the back-book of existing clients and selling additional services such as business-management and data-security tools. In some cases, the business-management tools have become as important to clients as base-processing so that, for example, we do not expect VNTV and First Data to lose business from WMT as it shifts volumes from Visa/MasterCard to MCX (where FIS will provide processing for debit and SYF for credit) because the two acquiring-processors have integrated with WMT’s general-ledger. With WMT likely paying only one-third of a cent per transaction, it is worth routing through First Data and VNTV to maintain this ledger-integration even on transactions where there is no need for an acquiring-processor connection to the Visa/MasterCard networks. The impact of gateways on industry-structure is to relegate acquiring-processors to a back-end processing role thereby limiting their ability to differentiate at the front-end and accelerating commoditization. Acquiring processors understand this and have responded through forward-integrating into the gateway business both organically (as First Data has built its eCommerce gateway as a leading provider of a “virtual terminal” for online transactions) and through acquisition with examples including VNTV’s purchase Litle and Element (online and offline gateways respectively) and GPN’s purchase of the APT and Realex gateways in the US and Europe respectively. However, other competitors have entered the gateway business including Visa’s purchase of Cybersource (owner of the Authorize.Net eCommerce gateway) in 2010 and Verifone acquiring Point, the largest gateway in Northern Europe for physical point-of-sale, in 2012. The strategic endgame is to acquire gateway capabilities for all three channels – browser, app, and iPOS – so as to provide a single omni-channel solution to retailers. The key bottleneck in this drive for omni-channel capabilities is that the gateway business for apps is a duopoly between Braintree (now owned by Paypal) and Stripe, and it is likely to remain so given these two companies have built large followings of third-party developers. After acquiring Braintree in 2013, PayPal has the strongest position as an omni-channel gateway provider since it has market-leading eCommerce capabilities from its core business, has the leading app gateway in Braintree, and is strongly-positioned to build its iPOS gateway at physical point-of-sale given its 2015 acquisition of Paydiant and, through that, relationship with the MCX merchant-payments consortium. Visa has also emerged as an omni-channel gateway provider through its purchase of Cybersource in 2010 (and hence acquisition of the leading Authorize.net eCommerce gateway), through its strategic partnership with Stripe (announced in July 2015 and including an investment of undisclosed amount that valued Stripe at $5bn), and through its partnership with Verifone (announced in June 2015) which operates a gateway for its VHQ terminal-management solution for physical point-of-sale.